The flavor of chocolate cookies is heightened with the addition of espresso to create these coffee chocolate crinkles. 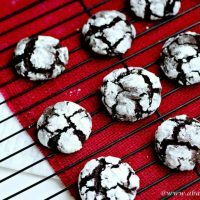 Chocolate crinkle cookies are perfect for a cookie exchange, holiday party or Christmas desserts too. 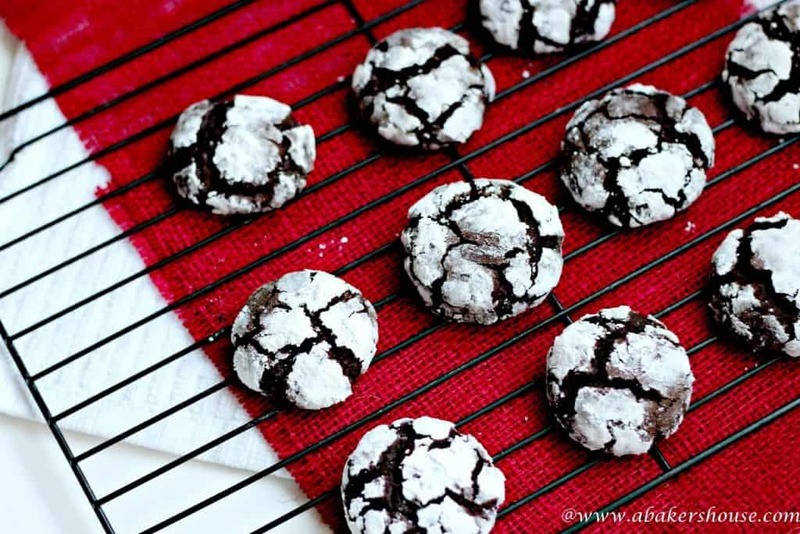 Coffee chocolate crinkles are strong contenders for my favorite Christmas cookie. I’ve tested a few cookies out as candidates to take to a neighborhood cookie exchange. Molasses ginger cookies, red velvet chocolate chip cookies, chocolate caramel thumbprint cookies, rugelach, and no bake kit kat squares are all excellent possibilities. I think holiday cookies not only have to be tasty, but they have to be something you wouldn’t make on some random day in July. No run of the mill cookies in sight. Make it special and something that you look forward to each December. Crinkle cookies are soft and chewy on the inside but have a crackled look on the outside. Chocolate crinkle cookies are fudgy and rich. Often crinkle cookie dough will be rolled in confectioners sugar before baking which gives them a snow covered look. Perfect for the holidays! 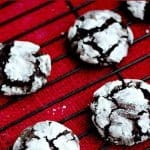 This easy chocolate crinkle cookie has the not so secret ingredient of brewed espresso which adds a punch of coffee flavor and deepens the chocolate taste. Coffee and chocolate are a perfect pairing! Keep in mind you don’t have to spend hours in the kitchen to bake up these holiday memories. Exactly the opposite is true. You will more likely make recipes an annual tradition if they are easy enough to make. Count on these coffee chocolate crinkle cookies to fit the bill. They are an easy Christmas cookie exchange recipe. Crinkle cookies are an easy recipe to double so that you can make a few batches at once. This particular recipe comes from the book Crazy about Cookies by Krystina Castella. Her version might even be more tempting—a Coffee Liqueur Crinkle. I didn’t have coffee liqueur on hand so I substituted espresso instead. Coffee would work nicely as well. So what do you think, will these pillow-like chocolate and coffee cookies be a hit at the cookie exchange? Or do you have a standby that you count on for your annual holiday party? These festive cookies are perfect for a cookie exchange party! Combine the flour, baking powder and salt in a bowl, set aside. Heat the chocolate and butter in a double boiler until melted. Set aside to cool. Beat the eggs, espresso and granulated sugar until smooth. Add the flour mixture and chocolate to the egg mixture. Wrap in plastic and refrigerate for 2-3 hours or until firm. Preheat the oven to 350 degrees F. Line baking sheets with parchment. Put the confectioners’ sugar in a bowl. Use a melon-baller to scoop consistent amounts of dough. Roll them in your hands into balls. Drop the dough balls into the confectioners’ sugar and coat thoroughly. Place the balls on the cookie sheets about 2 inches apart. One dozen should fit on each cookie sheet. Bake for 10 minutes then let cool for 5 minutes before transferring the cookies to a rack. Do you need a pretty way to present these cookies as a gift? Check out this post on creative packaging. Here are more ideas for 12 Cookies to Bake this Holiday Season. Post originally shared in 2012. Updated in 2018. These sound and look delicious! My stand-by at this time of year, is not cakes, but candies. Was given a very simple almond brittle recipe when I lived in Canada, on condition I never told anyone, and have made it every year since. Daughters have been told (that’s keeping it in the family, I felt!) but no one else. It works every time, everyone loves it – and hope to be doing some this year too. Thanks so much for your comment. I rarely make candies but love the thought of it. 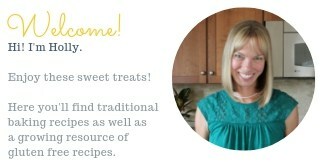 How special that you have a recipe shared with your daughters, must be quite a family tradition to make it. Enjoy! Oh my, these do look tempting. There’s just something about coffee and chocolate together that makes my heart sing. Thanks, Karen! You know I don’t drink coffee often but I love it in desserts, especially with chocolate. I really liked your post today and am going to try to come up with a meal to submit to Cooking Matters before this Friday if I can move that quickly. I hope I am up for the challenge! I love that photo Holly. And chocolate and espresso = yum. Thanks, Lea Ann! I might try coffee liqueur next time, Baileys Irish Cream would be nice too. Thanks, Pamela! Baking on Christmas Eve is such a special time. I hope your kids join you! This was my first try with chocolate crinkles and now I am seeing them everywhere! What have I been missing all of these years!? Thanks, Sarah! I agree with you– any cookie is a good cookie in my book! I completely agree with cookies for Christmas have to be something special and worth waiting for December to have. These sound great for the holidays, I love the icing sugar on top, reminds me of snow. Thanks for reminding me of these– can’t wait to make them again this year!